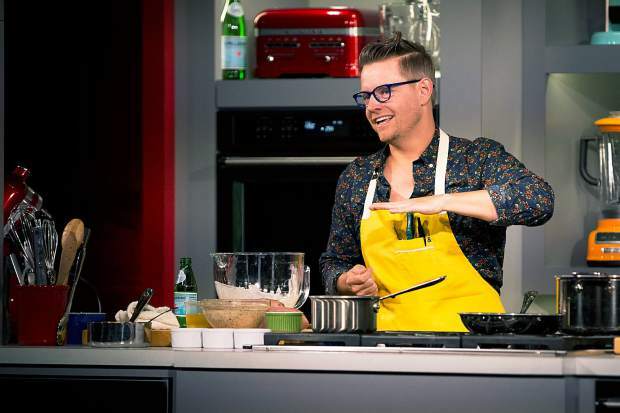 Chef Richard Blais hosts The Blais-wich Project demonstration during the Food & Wine Classic at the St. Regis Friday afternoon. With the 33rd annual Food & Wine Classic weekend behind us, The Aspen Times reflects on some of the highlights from the weekend. Points for honesty go to Stephanie Izard, the “Top Chef” Season 4 winner, Food & Wine Best New Chef from 2011 and James Beard Award winner who started Chicago’s The Girl and the Goat. During a Friday-morning beer-food pairing and preview of her forthcoming Chinese restaurant Duck Duck Goat, Izard discussed the distinct aroma of the garlic chives in her Szechuan chili sauce. They did kind of stink, but Izard kept her promise: served with her “slap” noodles, peppercorns and Szechuan goat sausage, they were a tasty complement to a deliciously bold dish. It all began with the St. Regis kickoff reception Thursday evening. There was Dana Cowin — she almost bumped into me as she made her way over to Andrew Zimmern to say hello. Then I saw Kristen Kish laughing with a group of her friends or family members. Next up: a delicious bite prepared by “Top Chef” winner Mei Lin that resembled some kind of Asian-inspired pork belly cassoulet. I snapped a selfie with her — couldn’t resist. I had heard all about the intimacy of the Food & Wine Classic in terms of the access you get to the big-name chefs, but it was icing on the cake to be rubbing elbows with them all weekend at events and parties. On my way to the Hotel Jerome for one of the trade-program panel discussions, I waited to cross Main Street alongside Eric Ripert. I saw him again at the Casa Dragones party Saturday night — I couldn’t resist another selfie, especially after I ate the single best meal of my life at his Blue restaurant at the Ritz-Carlton in Grand Cayman in August. I’m still talking about that dining experience nearly a year later. Another big moment was seeing Michelle Bernstein cooking up bites at the Lexus tent at Saturday’s Grand Tasting. She’s from Miami, and I’m a hometown Miami girl, so seeing her felt like a piece of home at the Classic. Her veal sweetbread taco was on point, too. When you’ve never missed an episode of “Top Chef” in its 12 seasons and have been writing about food off and on for nearly a decade — trying as many top-rated restaurants as possible in every city you visit along the way — it just doesn’t get any better to be a journalist in Aspen during the Food & Wine Classic. Bravo, Food & Wine. I can’t wait until next year. I’m a beer guy. You can find me at Aspen Brewing Co. and we’ll talk about saisons, special batches and what constitutes as “imperial” and what doesn’t. Upon arrival Sunday at the final Grand Tasting of the Food & Wine Classic, I was out of my element. Pouilly-Fume? I can’t even pronounce that — I pointed at bottles, grunted and held my glass out. My only prior experience with spittoons was for discarding peanut shells at Texas Roadhouse, and that’s not even what they’re made for. But by the end, I thought I could discern the different hints of flavors from wine to wine. A little hibiscus here, some petals and dryness there. This one has a mouthfeel akin to Windex. “I’ll try the ‘merlow,’ please.” The “T” is silent. I’m making progress. If there’s a long line leading into a white tent at 10 a.m. in Aspen, it’s likely the Food & Wine Classic. More specifically, a Champagne seminar. Jordan Salcito set the tone when she rocked front and center dressed as Austin Powers and threw the spit bucket off the stage, announcing, “We won’t be needing these.” We tasted some brilliant Champagnes, including a 2005 Dom Perignon debuted for the first time in the world right here in Aspen. Favorite Champagne descriptors: racy, zippy, chalky, grippy and, of course, delicious. Best part of the seminar: every wine we tasted was under $65 per bottle (except the vintage Dom, which sells for about $180). Move over, Veuve, I have six new friends. I was torn over which seminar to attend during the Saturday 10 a.m. slot, but I can say with 100 percent confidence that I chose wisely. Wine expert Mark Oldman struts onto the stage in a purple velvet smoking jacket with a tobacco pipe hanging out of his mouth. He tells attendees (those who made it in — others were turned away when the tent reached capacity) that the wines we were about to drink totaled about $2,000 if you were to buy the bottles retail. He said it was arguably one of the most expensive consumer wine tastings ever done. He poured mind-blowers like the 2011 Sassicaia and the Penfolds Grange, which retails for roughly $750 a bottle. We tried six big-time wines and Champagnes in all, and he brought attendees to the stage for a few Champagne sabers. I was lucky enough to sit near a gal who did the saber, brought the magnum back to her table and filled all of our glasses. He also told a tale about popping a 1964 Dom Perignon on the private jet he took to town with Jacques Pepin and Dana Cowin. And sure enough, upon review of his Instagram profile, there was a photo of the three of them doing exactly that. Not a bad way to travel, Mark. Fun fact: if you’re allergic to shellfish, you’re also allergic to insects. The crowds stepping up to the Delysia Cholcolatier table in the Grand Tasting tent on Saturday, no doubt unexpectedly, gained this bit of entomological wisdom when they asked the Delysia confectioners about the Cricket Bark (a sign on the table beckoned, “Ask about our Cricket Bark”). The bark candy – given out to Food & Winers who confirmed they weren’t allergic to shellfish/insects – includes fried crickets with soy beans, pumpkin seeds, cranberries and currants in chocolate. The crickets? They taste like peanuts. Now trending: foam … Had a mayo foam on white asparagus at Wines of Spain and two different fruit foams at Goose Island beer breakfast. Crazy, weird goodness. Lanyard people alert: Friday’s Magnum Party at the Jerome rocked with more magnums of wine and bubbly and more plastic body parts than a Hollywood red carpet after-party. Tim Love gets it. To him, cooking is about having fun with good people. During his demos, he likes to drink white wine and take shots of tequila with members of the audience. And in a tradition that started in Aspen, he likes to end with shot roulette: He blindfolds 12 people and pours 11 shots of tequila and one of canola oil. The unlucky oil recipient gets a bag of swag. Early on in the grand tasting on Saturday, I spent some time talking to the owner of Eagle Springs Organic and was the lucky recipient of a beautiful English cucumber. I guess carrying around a cucumber while everyone’s getting wasted makes you fodder for some pretty bad jokes, though. Whatever, y’all, it’s organic. It’s was a blazing hot Food & Wine weekend (no complaints here). Drinking advice from F&W magazine executive wine editor Ray Isle at his “Epic Summer Pairing” seminar: White wine is great for summer barbecues … but if it gets over 103 degrees, drink beer. A lot of beer. After the weekend I know many of you had, it was a little surprising to see so much energy to cap off the Classic at the Sunday afternoon Grand Tasting. Aspen knows how to rally. Lots of friendly faces filled the tents, but we all had some elbow room, which probably helped keep all those faces friendly. Tempranillo’s paella and pulled pork were big hits, as were the frog legs, shrimp and grits from Food & Wine’s best new chefs and the salmon pasta from the Alaskan Seafood Marketing Institute. It was a workday for me, so the booze kind of went by the wayside, but the wineries were nice enough to cough up plenty of swag anyway, and isn’t that what the Classic is all about?